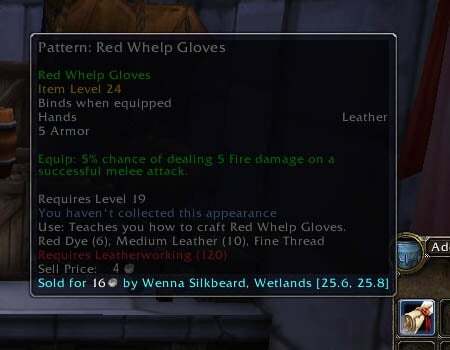 This addon adds information to the tooltip to remind you that you could obtain an item from a vendor/quest or mob drop instead. Supports Recipes, Vanity Pets, Bags, Mounts and now Armor and Weapons. A new money format display. 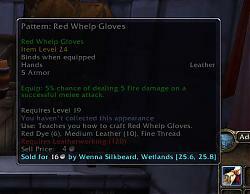 Display price item for profession available from a known NPC. Item obtainable from a quest. Sound on a item found. help - List of options. [item link] - Show info for an item in the chat window. Saving you gold from all your important purchases you make. To continue with improvements and updates for the future and beyond! It inspires my programming and helps me continue work on the addon, and a very big 'THANK YOU' from me. Originally Swindler Preventer updated by Thortok2000 original work by Gazmik Fizzwidget. Special thanks for all there work. Under a new name 'Fleecing Tip'. 40 NPC or Mob drops added. Added lists for Armor & Weapons. NEW: Sound effect added when item found. Can be toggled on/off with chat commands. NEW: Chat commands for money format display. Set coin/short or long. More data clean up and additions. Removed all old data thats no longer needed. Added 37 vendor locations and 25 more items. Fixed the copper coin not showing and other data errors. Removed 10 NPC's and 3 items. All Alliance/Horde NCP's coordinates done now! (Few! alot to check). Removed(comment out) all the tokens & reward system that are no longer in game. 6 items removed. 6 NPC's removed. Removed SwindlerPreventer_VendorsCoordinates.lua file now rewriten. Added 26 more NPC's, 37 items & 9 mob drops! !...still adding daily. All coordinates for nautral factions are complete and started on others, there are still alot to do! Redone a new way to display location using UiMapID API system. Created file SwindlerPreventer_Quests.lua file to hold all quest info on items. Lots of streamlining of code & rework of old data. Do you have any plans to add this to curse? It would be nice to have it on both, to increase the number of users. Only thing I ever really did was data update, bug fix, add mounts/pets/bags, and a 'detection' method to detect new data. Like the entire rest of the addon was his, originally called AdSpace.